I enjoyed my splurge on a hotel room last last and had a sleep in. A double bed, fresh sheets, endless hotwater = multiple showers, washing done and the novalty of TV. Would you believe 50 channels and nothing to watch. Of course you would. That’s too bad, as getting out of the habit of plonking myself down and watching drivel for hours has been a good one to break. With 38 days on the trail I have read no newspapers and watched zero TV. I have heard no news from any source and I love it. I’m sure the world is still turning: that politicians are discussing the same old tired issues and resolving nothing; I wouldn’t be surprised if Australia has a new Prime Minister; that the eternal war on terror that the 1% want to continue in perpetually is still going on; that oil stocks are continuing to deplete and we are doing to wean ourselves off the black gold drug. Ah… Life on the trail is so simple. Wake up, walk, eat stuff, drink water, let the mind wander, get some kilometres in and so on. The trail comes out direct opposite my hotel and a cafe across the road. I headed across the road for a nice big cooked breakfast. Eggs benny and real coffee is a great way to start the day. Once packed up and checked out I wandered into town, in no hurry at all today. I briefly met up with Chris and Cathi who were fresh out of the bakery. Mmmm…bakery…what a good idea. With lunch sorted I hit the trail at a leisurely pace. Straight out of town the trail skirted around the industrial area following the Mangaokewa Stream. The stream was quite clear for running through this sort of area but I wouldn’t be game to drink it without treating it. I was on the look out for trout but didn’t see any. Out behind a major limeworks plant, over a bridge and up hill through an old quarry area. 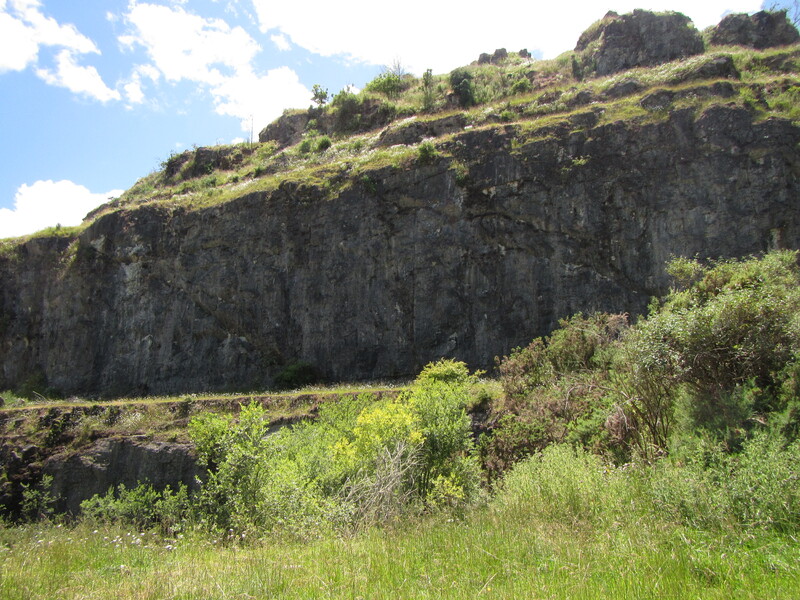 Some of the old quarry walls were high and steep. 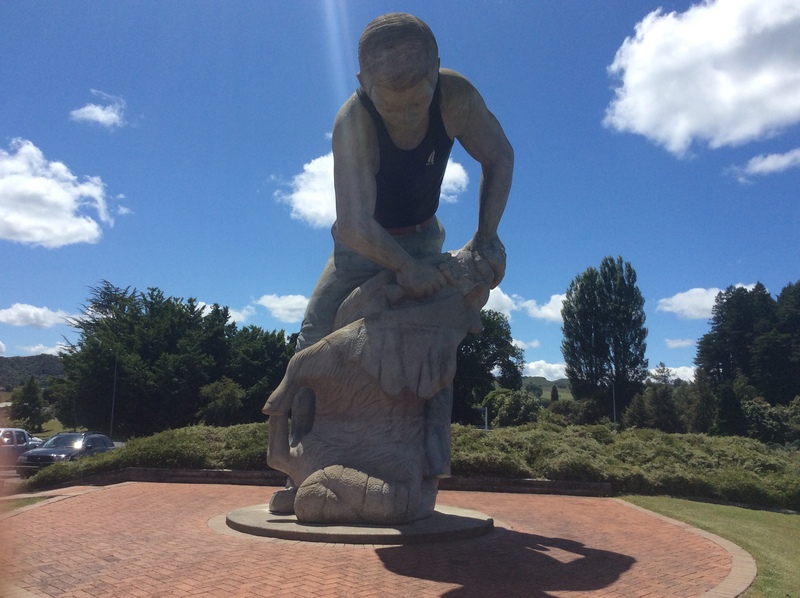 I immediately thought it would be the idea sports climbing crag if I lived in Te Kuiti and needed to be bolted. The trail then swung back to the river following through shaded forest along the rivers edge for a kilometre or so. Several side streams ran under the track to join the major river and some small picturesque waterfalls adjacent added to the scene. I could see the clearing of the Mangakewa Reserve on the other side of the river and knew there was a swing bridge coming up to cross onto the opposite side. The reserve was a lovely spot and in hindsight would have made the perfect camping spot to save a few bucks. There really isnt much in the way of accommodation for trampers in Te Kuiti – hotels, if you can afford them; a backpackers 3km out of town; and a cheap but very, very basic holiday park in town. Anyone coming through behond me, you are better to resupply at New World as you come off the trail,mget out of town and head for the reserve. In the shade of the forest on the east side of the river you can only really see a green corridor but crossing over out into the open and into the reserve offers clear views to the towering lime stone cliffs lining the upper banks of the river. From the reserve the trail meandered along the rivers edge for around 5km. I found the walking to be great. A clear sunny day, not a hassle on the world. It was difficult to find the trail at times but enough foot traffic had been through to point the way. There were a few steep ups and downs as the trail zig-zagged its way following the river through forest initially and opening up into farmland. The farmland tracks were hard under foot but I pressed on and eventually made it out to a farm road. It was a gradual lead in, with initially no distinction between the trail and the farm road but easy to follow. This continued for several kilometres before becoming a more formed road and finally hitting a road junction with the Mangaokewa Road. From Mangaokewa Road it was just a matter of waiting for a pre arranged pick up to take me into Benneydale and my place to stay for the night at Artdoc. The next section of trail is around 27km all on road and I chose to skip this tomorrow, instead opting to hitch from Benneydale to the start of the Timber Trail and continue on the Te Araroa. It also runs through private property with very few places to camp. Sure I could stealth camp and risk being asked to leave for trespassing or simply knocked on a door to ask to camp the night but doors were few and fair between. Besides if I’m not going to walk the next road section why look to camp on it instead of heading into town. I didn’t have to wait long and my ride was right on time, luckily so was I. Not sure what would have happened if an hour or two late with no phone reception. I’d have to keep walking. A short ride into Benneydale and I was welcomed at Artdoc by Maurice. Artdoc is a gallery come live music venue for jazz and folk and accommodation place popular with mountain bikers doing the Timber Trail MTB track. I think Maurice has the largest collection of vinyl records I have ever seen. Walls covered. 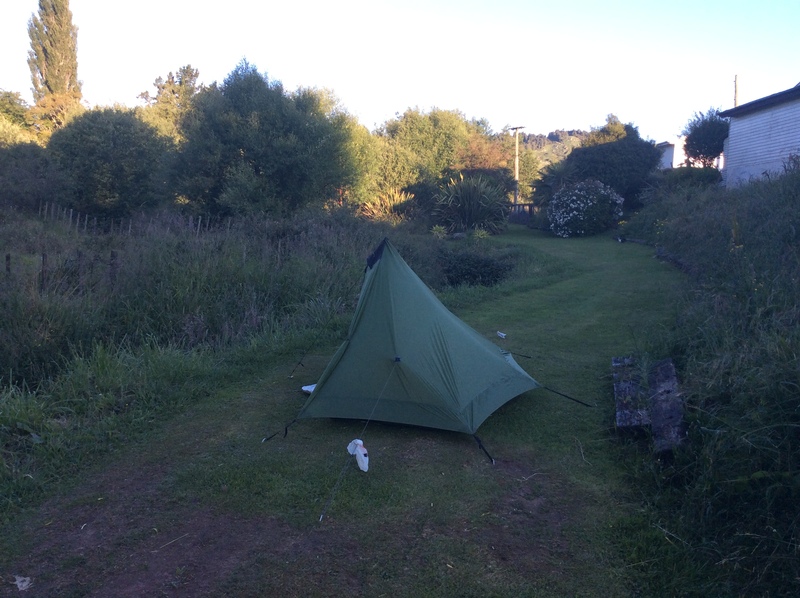 I was tenting outside for the night and found a quiet patch of lawn by a stream to set up. At $10 for a place to pitch a tent and have a hot shower it was a great deal. Tomorrow I hitch to Pureora Forest and get back onto the Te Araroa.